This book has a female college professor that builds a tesseract in her office. Her daughter is brainwashed by her boyfriend and accuses her father, the college professor's husband, of molesting her. The professor uses the tesseract to discover her husband is innocent. I read it around 1998 or so but I think it was a few years old at the time. 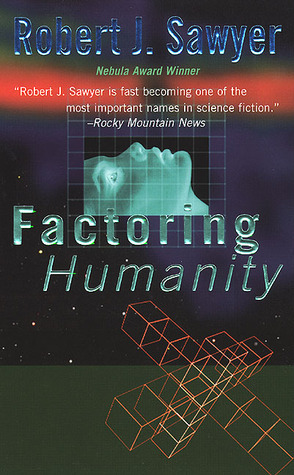 This is Factoring Humanity by Robert J. Sawyer, published in 1998. In the near future, a signal is detected coming from the Alpha Centauri system. Mysterious, unintelligible data streams in for ten years. Heather Davis, a professor in the University of Toronto psychology department, has devoted her career to deciphering the message. Her estranged husband, Kyle, is working on the development of artificial intelligence systems and new computer technology utilizing quantum effects to produce a near-infinite number of calculations simultaneously. When Heather achieves a breakthrough, the message reveals a startling new technology that rips the barriers of space and time, holding the promise of a new stage of human evolution. In concert with Kyle's discoveries of the nature of consciousness, the key to limitless exploration---or the end of the human race---appears close at hand. Reviews fill in some more of the details. The book starts out more like a soap opera than a SF novel. In the opening scene, the Davis' grown daughter shows up at their home and accuses Kyle of molesting her as a child. Heather has a break through with the indecipherable messages when she stumbles upon the solution; the messages are the plans to create a devices that allows someone to enter the 4th dimension and get in touch with humanity’s overmind. From my own personal memory of the book, it is the overmind that reveals that the accusations are false (inside the 4th dimension, memories of other people can be explored and real memories have a different character than false memories). I also believe the molestation accusations came from a therapist, not the boyfriend, although a boyfriend may well have been partially responsible as well (the idea of "false memory syndrome", real-seeming memories accidentally implanted by overeager psychologists using leading questions, etc, being one of the ideas the author wanted to explore). Not the answer you're looking for? Browse other questions tagged story-identification novel space or ask your own question.